If you are a regular PublicAdcampaign reader you will know we have been in close contact with a new outdoor advertising company called Mediacy, perpetrators of the new Gatescape advertising format. Our relationship developed after we received a press release for thier services months before they had even registered as an OAC, something which is illegal in its own right. We were concerned both with this new format in general, as well as the potential illegality of the entire operation. Long story short is we met with the founder Michael Gitter to discuss strategies which might use this new advertising format as a force for good. The final PublicAdCampaign proposal relied on Mediacy dedicating 51% of their locations to artists, something we vowed to help them with if they would agree to this single term which to us was the only way that this unwanted advertising would be in service of art as opposed to artwork serving the advertising and Mediacy as a whole. This proposal did not pan out for obvious reasons and our strained relationship has teetered on and off as our conversations/arguments have continued over the past few months. Without much headway being made, I had forgotten about Mediacy partially because I really haven't seen any Gatescape advertising around New York. Recently I came across the above image, a self advertisement for Mediacy's Gatescapes. 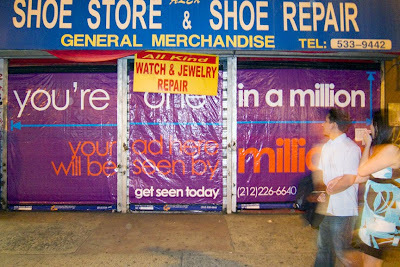 Now initially PublicAdCampaign's arguments against Mediacy were met by Mr. Gitter's insistence that Gatescapes would actually create a more aesthetic environment, combatting what are often graffiti bombed roll down gates in NY. I argued that 12'x20' street level advertisements were not an improvement to the public expression many call graffiti, but in the end this was a matter of opinion and we were left at a stalemate. After seeing this new self advertisement for Mediacy I was reminded that the whole aesthetic improvement argument was another sham perpetrated by Mediacy to help them sleep better at night and improve their selling points for potential advertising clients. I think we can all agree that the garish orange and purple vinyl sticker is an eyesore at best. I contacted Mr. Gitter about this and I received an immediate response in agreement, which was cc'd to Mediacy's artistic curator Julia Lazarus. Apparently they were both in agreement with me and were coming up with new options. Now here is where things get interesting. Mediacy is faced with a problem. They have hundreds of locations around NY and LA waiting to be purchased by advertisers. These locations are a new format and not on the radar of most potential clients. Their problem has become getting the word out, or essentially advertising their services. These new vinyl ads for themselves not only look terrible, but advertising for yourself also looks desperate. Along side these facts, Mediacy has also promised to present artwork as part of its proposed dedication to the cities it operates in, although I would argue the presentation of artwork is meant to shine the blinding light of altruism over their occupation of our city with unwanted commercial content. That said I recently received a phone call from a good friend, street artist, and NYSAT participant. (I will not divulge the artists name as I believe he is still in talks with Mediacy about potential agreements) This artist had been offered 30 Gatescapes by Mediacy around NYC and wanted my advice on whether or not to participate. Each Gatescape would have the artists contact info as well as Mediacy's information printed in some small font at the bottom of each image. I was infuriated by this fact for a number of reasons, first being that Mediacy has continually denounced the NYSAT activities and its participants, as well as what I thought was an obvious play to use a young talent to promote Mediacy's agenda, mainly attracting potential advertising clients. Mr. Gitter scoffed at the idea that the 30 Gatescapes offered were nothing more than Mediacy using an artist and their work as a better alternative to their garish purple and orange self advertising but the facts seem to say otherwise. Why would Mediacy offer 30 locations to the same artist if the intention behind presenting art was to promote local talents. Would it not be better to use Julia, the in house curator, to actually curate a group of artists so that NYC would be presented with a wide array of talents? Offering 30 locations to a single artist seems more like a quick fix for a problem of low visibility. Now if the problem is simply low visibility, Mediacy could just print out 30 more of those awful self advertisements, but again they look horrendous and we all know it. A better marketing solution is to use the same money that would be used to print the self ads to print artwork. The artwork will serve the same purpose as the self ads while looking like Mediacy is in it for the people. To me, all of this is relatively self evident although I'm sure from different perspectives, one could argue otherwise. I am writing this as much for the artist in question as I am for myself. Indeed the presentation of ones work at 30 prime street level locations around NYC is a fantastic opportunity for any artist looking to put themselves in a more visible position. The problem is not whether or not to promote ones own work but in the end who your work is actually serving beyond yourself, and who it might be potentially hurting, the public. In this case the artwork is serving the artist, but also an outdoor advertising company that intends to litter our streets with unwanted commercial copy. Mediacy will surely find an artist willing to overlook the fact that their work will be used to further Mediacy's presence and control of our city's streets. Even without artistic help, they will almost inevitably find advertisers along the way and in the end fulfill their goal of abusing public space, but as artists is our own self promotion worth cozying up to a company who's ultimate goal is the destruction of our shared public environment? There are so many other ways to promote our work, and do so in a fashion which does not jeopardize both the city we live in and the integrity of our artistic talents which we work so hard to cultivate. Ultimately I think this all really comes down to how we feel about our city streets and their use for commercial content. I truly believe that the outdoor media landscape, now controlled by advertising which silences many other forms of public discourse by monetizing public space and overwhelming other forms of public address, is in need of our protection. What is at stake is a democratic space meant to sustain all forms of public communication being overrun by commercial enterprises intent on controlling those public communications. It is important as artists and public citizens that we use our shared public spaces to communicate with one another, but as well to address the outdoor advertising industry's control of that space. To do this we must understand that our participation in the outdoor advertising industry, even if it is through our own artwork, feeds this system of control and further prevents our communities use of the public environment for what are incredibly important alternative public thoughts and ideas which fall outside of the current advertising/authorized uses of public space. If we imagine an outdoor media landscape that fulfills its goal of presenting all forms of public address, we simply cannot promote a system which not only silences and criminalizes unauthorized public communications, but in doing so also controls what other forms of address besides the commercial, are presented on our city streets.